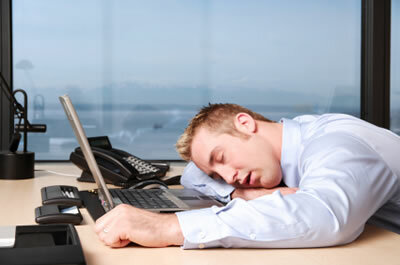 Home » Blog » Is Insomnia Turning You into a Liability at Work? Is Insomnia Turning You into a Liability at Work? Insomnia is a national epidemic. Depending on who you ask, as many as 40-70 million people in the US have insomnia or some other chronic sleep disorder. And it’s costing them more than a good night’s rest. Aside from such associated health woes as hypertension, diabetes, obesity and major heart related issues, recent research published in the Archives of General Psychiatry shows insomnia is the root of 274,000 errors and accidents that occur in the workplace each year, setting back businesses by about $31 billion in remedial costs and lost revenue. If you haven’t been sleeping well, and you’re feeling fatigued, you could find yourself becoming more than just clumsy or forgetful. You could be a drain on productivity. You could become accident prone. Either way, it means you’re a liability in the workplace, and your boss or colleagues may already be noticing. From this perspective, getting help for insomnia becomes an opportunity cost in terms of time and money spent on treatment. Just as we often pay for the gas that gets us to the office or the phones that keep us in touch with clients, getting help for sleep-related issues may very well protect your ability to be a productive and safe member of the workforce. Otherwise, all the talent, experience and capabilities you bring to work could very well be moot. Everyone experiences a restless night now and then. We all occasionally show up at work less refreshed and a shadow of our usual selves. But when insomnia becomes a regular occurrence, it’s time to seek help. Start by speaking with your doctor who can assist you with taking the proper steps to address the problem. These may include adopting new habits that can help you get higher quality sleep, medication, and going to a sleep specialist or sleep lab. A Google search will help you find a sleep center near you, or you could try WebMD, which has a list of sleep centers on its website. There are also monitoring and sleep regulation tools you can try, such as SleepRate, which can help pinpoint the issues that are affecting your sleep so they may be corrected. But the most important thing to remember, if you’re suffering from a lack of sleep and it’s starting to affect your performance and safety in the workplace, help is available for those who take their sleep seriously. Since it’s directly tied to our ability to bring home a paycheck, shouldn’t we all?